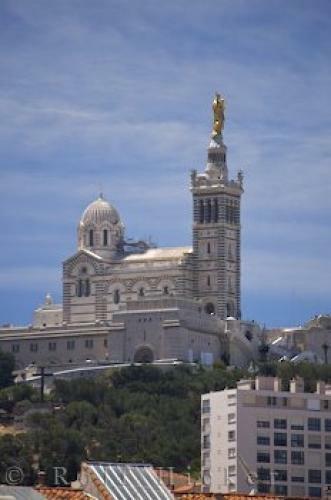 The most outstanding Second Empire landmark in the city of Marseille in Provence, France in Europe is the Notre Dame de la Garde Church atop the La Garde hill. Notre Dame de la Garde in Marseille, France. ... You can ride the 'Little Train' or take the #60 bus from cours Jean Ballard in Vieux Port. However you get to Notre Dame de La Garde, the 360 degree view of Marseille in Provence and the surrounding land and sea is spectacular.Notre Dame de la Garde seen from Vieux Port in the city of Marseille, Bouches du Rhone, Cote Bleue, Blue Coast, Mediterranean, Provence, France, Europe. I photographed this photo with the digital SLR camera model Canon EOS-1Ds Mark II, aperture of f/6.3, exposure time of 1/250 sec. on ISO 100, as always I used a original Canon Lens, the focus lenght for this picture was 400mm.